Over the next 7 weeks, we will publish a series which takes each outcome in turn, and highlights some of the diverse activity going on around the country. We will point to material we or others have published in the past, and showcase some new projects. In some cases, we’ll publish an introduction, then follow up with more examples during the week that follows. The first outcome we are going to focus on is…..
We know that reading and literacy are two of the most fundamental life skills, and this is possibly one of the most obvious things people think of when they picture a library - a place where you have access to books and which is dedicated to encouraging the love of reading. Libraries don't care who you are or where you come from - they give everyone free access to books, regardless of age, disability, wealth or education. Reading for pleasure is important. Research suggests that both children and adults who read are healthier, happier and more confident than those who don’t. Libraries encourage reading by running reading programmes, hosting book clubs and by providing advice to help people extend and develop their reading choices. Below is the icon we have created to symbolise this outcome. To make it easier to spot related content, you’ll start to see this on material produced by the Libraries Taskforce that relates to work being done that supports this outcome and, as it’s freely available to download from this folder, perhaps in other places too? Read more about this offer on the SCL website. One of the best known reading related events that is enjoyed by hundreds of thousands of children every year is the Summer Reading Challenge. This year, the Challenge is called the Big Friendly Read and is delivered in collaboration with The Roald Dahl Literary Estate to celebrate the centenary of Roald Dahl’s birth. Children are encouraged to sign up and read 6 books over the summer holidays, and those who complete the challenge receive a certificate and a medal at the end. In a parallel programme, young people are encouraged to take part in a volunteering programme, part of Reading Hack (see below), where they work in libraries to sign children up and help with summer activities. The Challenge is run by The Reading Agency, in partnership with the SCL, and last year, 787,000 children took part. This evaluation of the Challenge, done in 2009 by The UK Literacy Association showed a wide range of benefits, both as felt by the children themselves, and as judged by their teachers. Libraries run a wide range of reading groups, including staff reading groups, multi-cultural groups, father and son groups, thematic reading groups and young mothers' groups. We met a group of researchers who are looking at how library services are developing their work with reading groups. They shared their findings so far in a blog post, and promised to come back and tell us more once their work was complete. This year, the BBC are mid-way through a year of focusing on books and reading: #LovetoRead. Stephen James-Yeoman wrote a blog post for us recently where he shared what has happened so far and their plans for the culmination of the season - the #LovetoRead weekend on 5 and 6 November when the BBC and partners will invite everyone, everywhere to read something new. Many libraries are now organising creative activities for 13-24 year olds through The Reading Agency’s Reading Hack programme. Suffolk libraries blogged about their experience of running a group. We’ve talked above about the Summer Reading Challenge for children. Look out for a post later this week on adult reading challenges, which may not as ubiquitous, but are taking place across the country. We’ll also highlight the Publishers Association’s Reading Ambassadors scheme. Next week we’ll share examples of how libraries contribute to cultural and creative enrichment. i work work in a university library in ghana n fascinated by the wonderful work u are doing for 3rd world countries. I am a librarian working with a Young Offenders Institute - the library is central to encourage reading and literacy. These young people have often come from environments in which reading was not modeled or encouraged and our library can make a huge difference to users' attitudes to books and reading. Every new offender comes up to the library a couple of times during their first week and we run various reading projects, for example Reading Ahead (previously the Six Book Challenge) and reading groups. 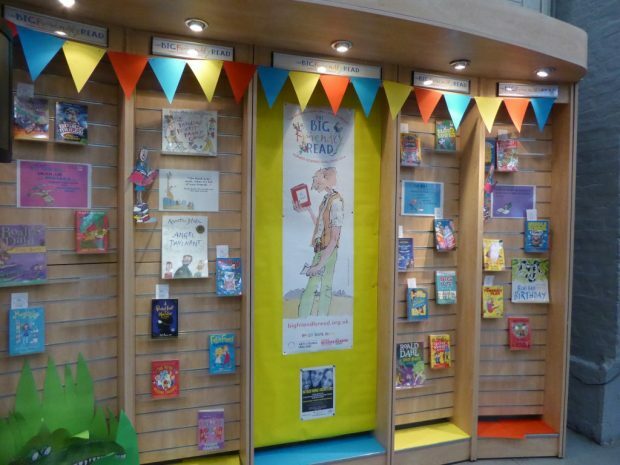 This year we will be running Bookweek Scotland inside for the first time, with author visits and other events.